With a flurry of heated, last minute negotiating in the early hours of the New Year, the warring houses of the US government struck a deal on the “fiscal cliff” of the budget crisis. While the compromise deal left major spending cuts in place and eliminated some hoped-for benefits, economists and financial experts are predicting that some provisions of the deal offer a boost to the slow-moving housing recovery. And the message may be mixed for those heroic investor owning single family and multiplex properties. Real estate professional and housing industry experts had been closely following the impact of the negotiations on two major tax provisions: the mortgage interest deduction, and tax relief for mortgage debt forgiveness. Both these provisions survived the deal. The mortgage interest tax deduction, which allows borrowers holding mortgages on both residential and investment properties to deduct the amount paid annually for private mortgage insurance – one of the most prized tax breaks among the many afforded to property owners. This deduction, along with others for property maintenance and expenses, contributes to the long-term return on a property investment. 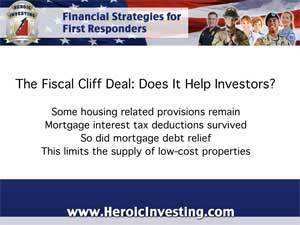 The fiscal cliff deal also extended a major tax break on mortgage debt forgiveness for one year. – a provision that touches investors indirectly by affecting the supply of available houses on the market. Under the provisions of a law signed in 2007, debt relief on loan modifications, foreclosures and short sales were not taxable. Those breaks, set to end in 2012, were extended for one year under online casino the new deal. In 2012, short sales – where a homeowner sells a house for less than the value of the mortgage with the permission of the lender – surged, thanks to expanded assistance programs for struggling homeowners. A repeal of the tax breaks associated with short sales and other avenues for avoiding mortgage default could have limited the number of short sales and other avenues for avoiding foreclosure. The continued availability of tax relief for homeowners trying to avoid foreclosure through a short sale may put more properties on the market. The combination of these measures to keep some relief in place for distressed homeowners is expected to keep the number of foreclosures down, thus giving the slowly recovering housing market a boost. 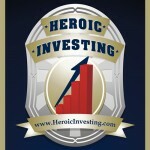 Home prices should also rise as a result of continuing those benefits to mortgage holders. For investors following Jason Hartman’s strategies for increasing wealth through real estate, the preservation of the mortgage interest deduction means a tax-year advantage. But keeping tax breaks for mortgage debt relief may have the effect of limiting the number of properties available for purchase at low foreclosure prices for the near future. Still, the retention of two key housing related provisions after the dust settled may mean that in some ways, the recovering housing market survived the fiscal cliff.